Here's a fun printable for Five Green Speckled Frogs. Print onto card, magnetic printer paper or printer felt and use to accompany the popular children's song / rhyme. Four frog bookmarks to print and cut out with the kids, blank for your own writing or message or for recording your place in your reading book. These funny frog bookmarks are so simple to print and cut out and really liven up any book that they are used in. I hope the kids love them as much as we do! These funny little frogs really perk up this cutting skills printable! The kids should try to follow the lines carefully, stopping short of the frogs and starting with the top line. Here's a cute frog jigsaw for kids - just print, cut it out using one of our cutting guides, and then put it back together again! Instructions and cutting guides for this jigsaw are here. Four funny frog jokes to enjoy on these printable frog joke bookmarks - perfect for cheering up your reading book! Print, cut out, punch holes and lace or sew this lovely frog lacing card. Our frog life cycle matching cards can be cut horizontally only and folded in half to make them double sided, or cut out individually for matching games and activities - making them very versatile and useful. It's easy to learn about the lifecycle of a frog with this fun and simple to understand life cycle poster. Great for class discussions - have the children ever seen frog spawn or a full-sized frog in real-life perhaps? Useful in so many ways, this set of frog life cycle word cards can be used for displays, vocabulary work etc. Here's a lovely bright frog mask to print out for the kids to use in role play or fancy dress! Just click the link below for a high quality printable version. Use these cute frog number line markers with our lily pad number line and lily pad number line skip counting by 4. We keep finding new favourites among our animal images but I think you have to agree that this frog poster definitely has the cute factor! I love this photographic poster of a frog as it demonstrates so well the camouflage that protects the frog, blending it into its surroundings. Frogs are strange shapes, as this outline frog template shows! It's a little tricky to cut out so may be more appropriate as a tracing or colouring activity. Use this simple frog template with younger children. Print out onto green card or cut out of green craft foam, then add stickers, splodges of paint, large googly eyes - whatever you like! Colour in (or print our coloured version), cut and re-assemble this fun frogs counting jigsaw to help kids learn their numbers up to 10. Slice along the vertical lines. This fun activity asks children to cut out three rectangles and glue them in the correct place on our frogs picture. When they are stuck tight, why not colour the picture in? Available in colour or black and white, this printable jigsaw features some silly frogs enjoying the time of day on their lily pads. Print and then cut out along the vertical lines. Children put the picture back together using the ordinal numbers to help. Children can use their green playdough to mould some frogs to sit on the lilypads on this fun printable playdough mat. Actually, who said the frogs had to be green! This card is ready to print, fold and give, and it's perfect for people who like frogs! It would make a fun birthday card for all ages too. How about printing out this lovely, colourful frogs scene poster to decorate the classroom or nursery? It would make a fun folder cover for a frogs project, too. 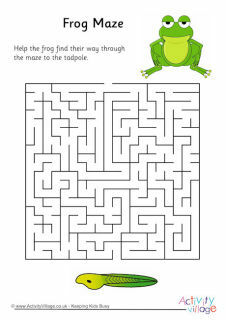 Kids can learn to draw a frog with this fun step by step guide. This printable number line provides lily pad numbers from 1 to 50 - perfect for our frog number line markers to hop along. We designed this lily pad number line, with numbers divisible by 4 highlighted in yellow, to be used with out frog number line markers, with Leap Year in mind - but of course if works well for 4 times tables practice too. The Frog - a little poem printable to enjoy with your kids!